GAWDA’s Contact Booth Program provides distributors with an opportunity to view the latest tools and equipment from dozens of suppliers in just a few hours. Many people think of trade shows as mostly fun for the customers, who are likely to be wined, dined and wooed by suppliers, but when you consider the cost of attendance and the importance of careful and economical purchases, both sides have an equal stake in making the most of a trade show experience. According to the Association of Event Organizers, 87 percent of business directors agree that it is easier to communicate face-to-face rather than on the phone or via email. 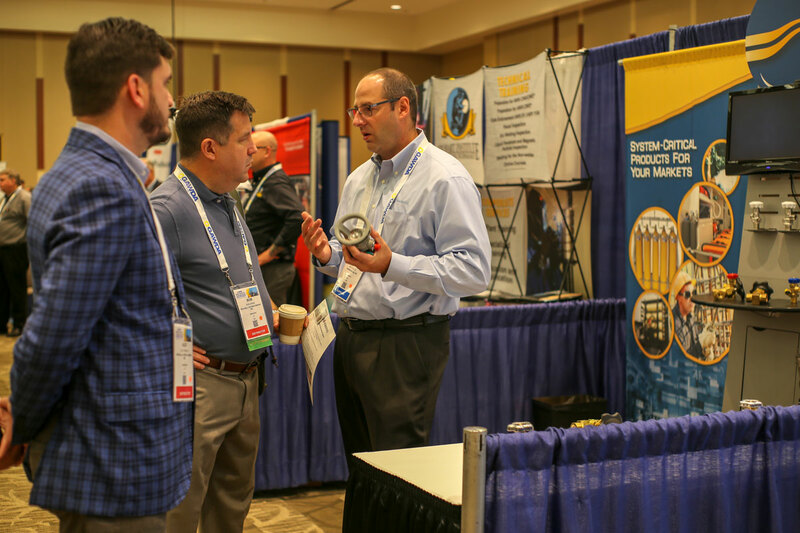 GAWDA’s Contact Booth Program offers members a unique opportunity to connect with both sides of the welding and gas distribution business. “It’s a great opportunity to meet new vendors, see the new technologies and check out the competition,” said Eric Terwilliger, vice president at Airweld, Inc. “This industry is unusual in that everyone works together.” Here are some tips for tackling a trade show from the distributor point of view. This saves money in several ways: early bird discounts on attendance tickets, cheaper airfare and getting in before the discounted hotel room block sells out are three of the biggest advantages. In addition, you will be in the loop for the all the news ahead of the show or conference, including special events, lists of suppliers and networking opportunities. You may also have an opportunity to schedule one-on-one meetings with your must-see suppliers. Trade shows can be enormous, and you want to make sure not to miss out on any new tools, equipment, services or promotions. Most shows will provide an exhibitor map and/or a list of exhibitors a week or more ahead of time, so be sure to plan your route or at least make a short list of your must-see’s. You will undoubtedly run into colleagues and friends during the show, but be aware that side conversations can easily eat away precious time, so make plans to meet up afterwards and focus on the suppliers you have traveled to see. You may have come to the show with specific suppliers in mind, but the wonderful thing about trade shows is that they present one of the best opportunities for learning about industry-specific innovations. If something looks interesting — even if you are pressed for time — at least grab a pamphlet and hang onto it so it will trigger you to look it up later. Also, don’t be afraid to visit new companies when shopping around for products and services. Small companies and startups have a greater incentive to attract customers and often provide exceptional customer service and special pricing to win your business. Get out there and introduce yourself and your company. Make the best use of networking opportunities and events in the evenings — GAWDA members are always glad to share information, ideas and solutions to shared challenges. You never know where you might pick up an idea for a new product or service, or even meet your next customer. Afterwards, stay in touch with the contacts you have made via phone, email or social media. GAWDA members have a unique understanding of your needs and challenges and can be great sources of information and ideas. Nearly everyone who visits a trade show is very excited and energized by the dazzling displays of new products and information and walks away with a bag full of freebies and product data to show for it. Don’t waste it! In that free bag of goodies, you have a compilation of all the industry’s latest offerings. One great use of a long plane ride home is going through the stack of pamphlets you picked up at a show. While it is still fresh in your mind, write notes on each pamphlet about what caught your eye about the product and the supplier. Then when you get home, instead of just tossing the pile aside where it is likely to be forgotten, you will be prepared to immediately make use of it to select the products and services that will best help to grow your business.